Earn a GED® while you complete a short-term certificate program in the railroad field, leading to industry-recognized credentials and improved job prospects. Become an AO-K student today! When all courses are completed, you’ll have earned a college credential with a Railroad Conductor certificate. The Railroad Conductor pathway can help build your credentials, education, and earning potential. You will study at the National Academy of Railroad Sciences (NARS), a partnership between Johnson County Community College and BNSF Railway. Using both classroom and in the field training, you will learn about rules and signals, safety policies and procedures, train mechanics and on-the-job requirements. 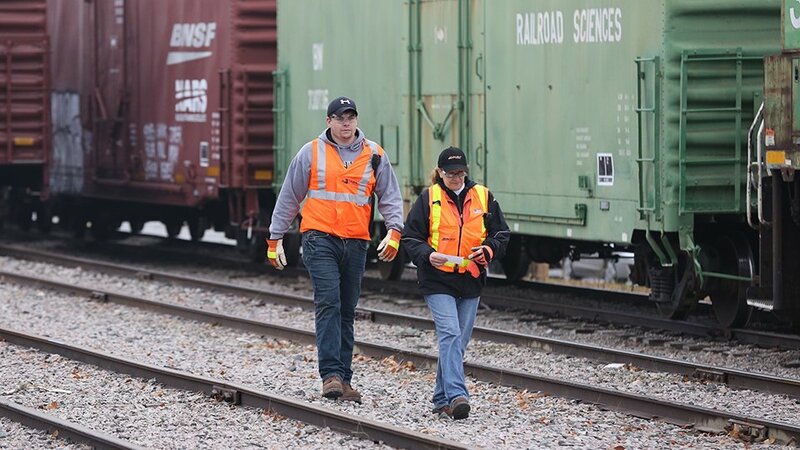 As a Railroad Conductor, you will adhere to strict safety regulations and guidelines, ensure rail cars are in proper working order, distribute cargo and weight evenly along the train, and maintain communication with the train’s engineer, traffic control and other crew members. The Kansas Department of Commerce reports wages for Railroad Conductors are very competitive. The median wage for Railroad Conductors is $57,480 per year in the state of Kansas.